I have a hazy white marble stain where my electric toothbrush stands on a marble countertop. Yes, either a poultice or an etch remover is needed to remove a toothpaste stain in marble... or possibly both. Toothpaste, shaving cream, cologne, and other bathroom products are often acidic or alkaline and can damage marble countertops and tile by "etching" (chemically burning) the surface. Marble will etch because it is made of calcium carbonate, which will react with acids and sometimes alkalines. What happens is the toothpaste (or mouthwash, etc.) eats into the marble "etching" the surface. If the surface is honed or tumbled, then you won't notice the dull etch marks as much, but they are very obvious on a polished marble surface. Products can also "stain" (absorb into the stone). Polished marble is not very porous and resists staining well, but often what happens is the marble will be etched (destroying the smooth polish creating a more porous surface) and then stained (when the toothpaste absorbs into the stone). Typically, etching is lighter than the marble color. Often just a dull spot, but can be chalky in appearance as well. "Stains" in marble, on the other hand, are darker or can be the color of the staining substance. You may have a little of both going on here which will dictate the marble repair method(s) needed. First, try to remove a possible toothpaste stain. I'd recommend you apply a poultice to remove any potential toothpaste stain. The toothpaste may have only etched the marble (and not stained) but since dried toothpaste is often a light color... it's possible. 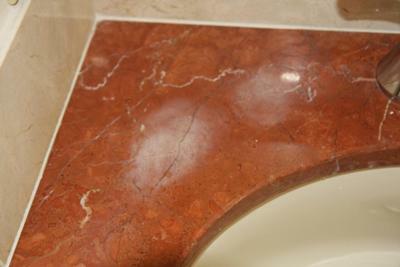 Removing a stain in marble should always be done prior to repairing etch marks and it's a cheap and easy procedure. Mix baby/talc powder with acetone into a paste like peanut butter (or soak a mat of 10-12 paper towels with acetone) and apply to the toothpaste stain about 1/2 inch thick with a 1/2 border. with plastic wrap and seal all the edges with blue painter's tape. Other types of tape may leave a residue or even stain. Let the poultice sit for 24 hours, then remove the plastic wrap, but let the poultice dry completely before touching it. That'll take another day probably, but just wait until good and dry. Remove the poultice, clean, and dry the area. If the toothpaste stains look exactly the same, then you probably didn't have any staining... just etching. If you notice a difference, then you may want to make and apply a poultice again to get more of the toothpaste out of the marble. The above should work for this toothpaste stain, however, stains caused by other substances will need a different "recipe". Removing marble stains of all types is fully explained in the Removing Granite & Marble Stains e-book. Buy an effective marble polishing product (I recommend ETCH REMOVER / Marble Polishing Paste) and follow the directions for re-polishing the hazy toothpaste etch marks. Note, this product will restore the shiny finish. If your finish is honed (matte finish - not shiny), then don't use the above product. Use these Marble Polishing Pads - Drill Kit. Actually, the drill kit pads will repair etching on both polished and honed finishes. Meaning the pads can be used to make the finish honed (matte) or polished (shiny). "Polishing" to a shine is just one more step beyond honing. Hopefully, this will do the trick; however, I imagine the toothpaste spots developed over a long period of time and the etching could be severe enough to warrant professional marble restoration. If the spots are rough, then DIY solutions may struggle a bit but still worth a go since a pro will be expensive. You could try the marble polishing product or pads first. You may get satisfactory results and not have to mess with the poultice. Possibly there is no toothpaste stain... only etching. If no results with the pads or etch remover, try the poultice and then polishing powder again. Still no good... call a pro. my day worker put Clorox Bath and toilet bowl cleaner on my black granite countertop and it left a ring. How can I get that ring out? ANSWER: Ring on black granite? Either it's a reaction with any sealer which may have been applied to the countertop (some sealers are sensitive to chemicals) OR you have a "doctored" countertop. Granite is not sensitive to mild acids or household cleaners. I'll bet it is doctored. Becoming far too common with black granite. The factory applies a black polish of sorts to make the countertop "more black." This polish is sensitive to chemical. If this is the case, then you'll need to strip the doctored polish off the countertop. The only other possibility is that you have marble and not granite. Marble is sensitive to chemicals.